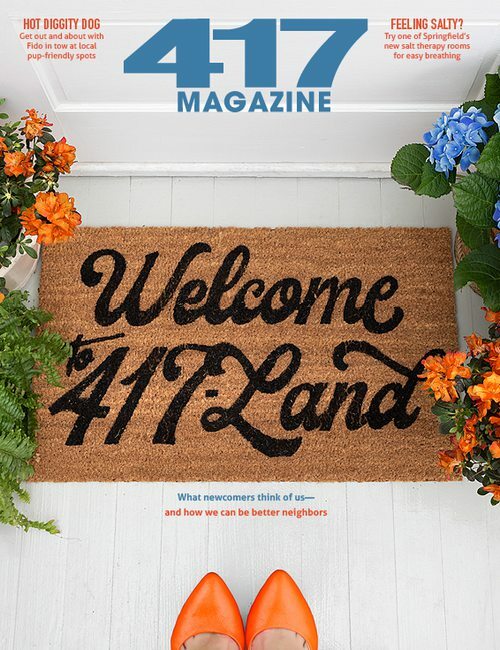 Equipped with growling bellies and full tanks of gas, we sent four writers on a mouthwatering multi-day journey from corner to corner in 417-land and beyond to find the tastiest, most inventive restaurants dotted throughout the Ozarks. 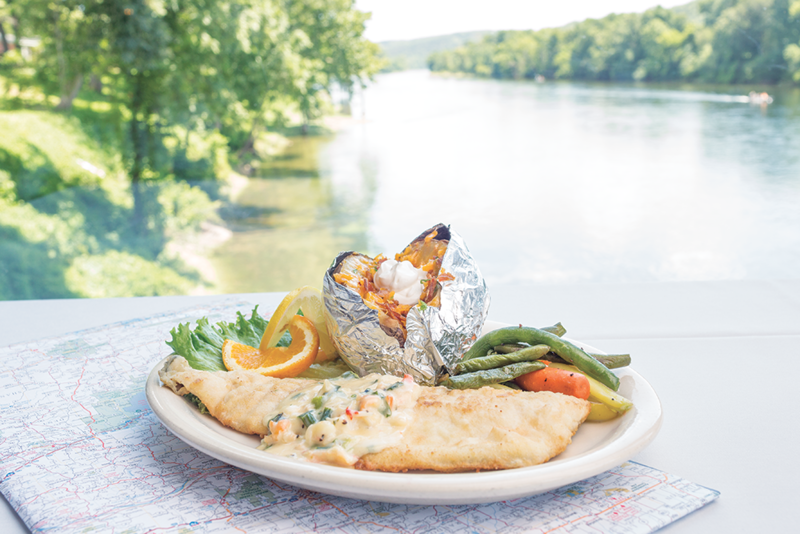 Photo by Chuck TraversGaston's White River Resort in Lakeview, Arkansas, offers a plethora of fine-dining options, including pan-seared rainbow trout with a house-made sauce and a loaded baked potato. The main dining room at the restaurant overlooks the gorgeous White River. There’s a whole lot of delicious food that’s served up outside of the Springfield city limits, and we made it our mission to find the very best of it. 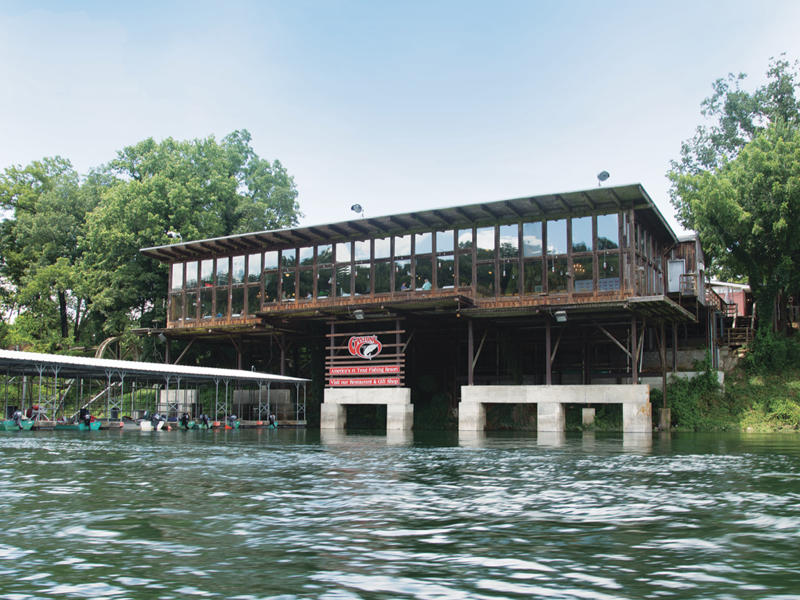 Equipped with growling bellies and full tanks of gas, we sent four writers on a mouthwatering multi-day journey from corner to corner in 417-land and beyond to find the tastiest, most inventive restaurants dotted throughout the Ozarks. On each and every one of these gut-busting day treks, we visited and taste-tested the towns’ best eateries to make sure they offer up plenty of deliciousness in exchange for a day’s drive. After we packed ourselves full of decadent French food, gourmet farm-to-table fare and a whole lot of tasty fish, wraps, sandwiches, steaks, pies, cakes and more, we all came to an agreement: Every one of these restaurants is dishing out food that is more than worthy of a couple hours behind the wheel. Ready for your own ambrosial adventure? Hop in the car, crank up the tunes and get hungry for a road trip. Photos by Chuck Travers For lunch with a view, snag a table at the restaurant's sun-filled dining room (left), then head outdoors to watch the boats sail by. An hour north of Springfield, Stockton Lake is the perfect place to spend a day relaxing near the water and filling up on great food. 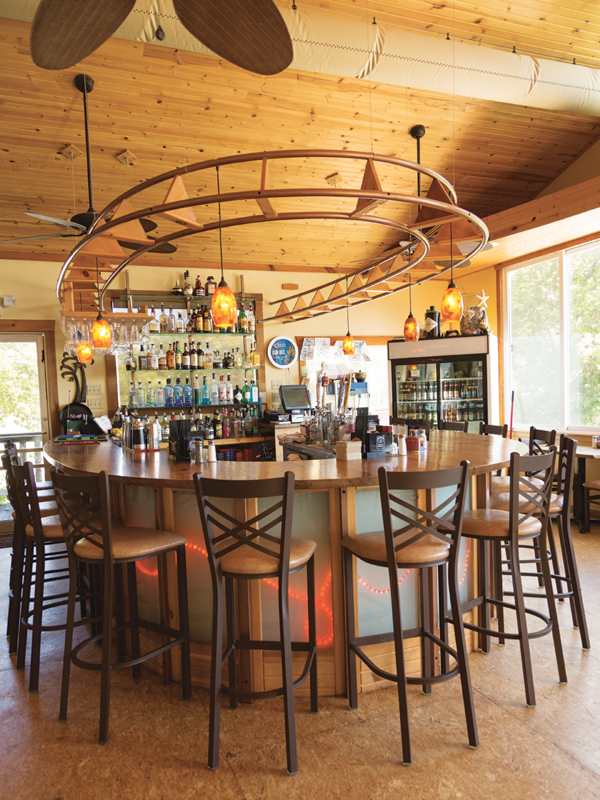 Head to the restaurant at Orleans Trail Resort and Marina (15828 S. 1525 Road, Stockton, 417-276-3566) to fuel up for a day on the water. Try the pork fingers (think chicken strips made with the other white meat) with white or brown gravy when you want something crispy and tender served piping hot. Then grab a tangy Cuban sandwich or a bacon cheeseburger piled so high you have to roll up your sleeves and grab extra napkins. Complete your meal with a homemade dessert, like blackberry cobbler or Butterfinger cheesecake. On a breezy, perfect-weather day, enjoy your meal on the balcony to watch the sailboats come and go from the marina while you plan your lake adventures. 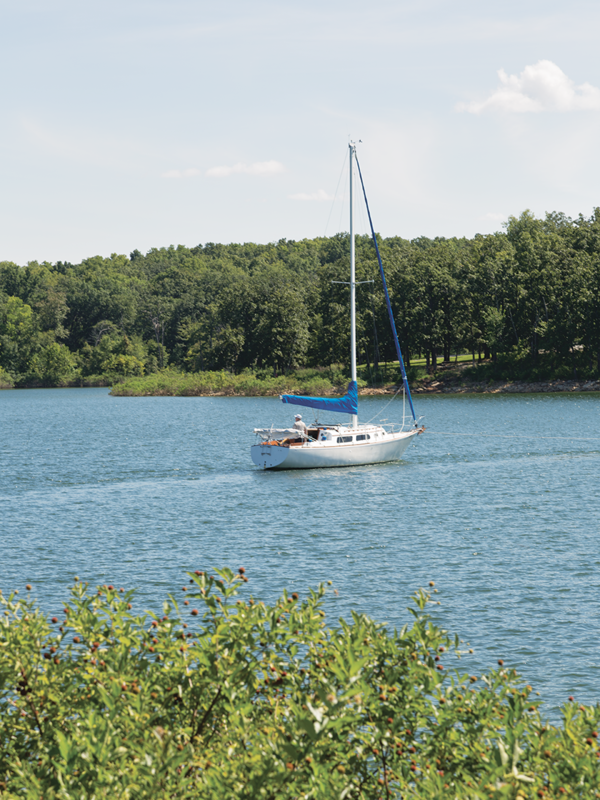 Head across the lake to Stockton State Park Marina (18610 E. 2000th Rd., Dadeville, 417-276-5329) for sailing lessons. Make a weekend of it by enrolling in a two-day course for $625 for one person, or $550 per person for a couple. The fees cover all course materials and a one-year membership to the American Sailing Association. After passing the course, rent a sailboat from the marina with a discounted price and put your skills to use on the lake. For more information, call or email Harry Lefferts at info@stocktonstateparkmarina.com. Photo by Chuck TraversThe filets at Gobbler’s Roost aren’t limited to a half pound: these cuts are usually 16 to18 ounces! Roughly a two-hour drive northwest of Springfield, Gobbler’s Roost in Nevada serves up special five-course meals. Turning onto a bumpy gravel road, it’s easy to think you’ve made a wrong turn, but just down the way is Gobbler’s Roost. And it might just be Nevada’s best-kept secret. Only open Thursday, Friday and Saturday evenings, this steakhouse fills quickly with regulars who have long enjoyed the restaurant’s five-course dinners served on Friday and Saturday nights. Just turn into the property and continue past the two horses grazing out front till you reach the restaurant, which fits just 40 people comfortably. 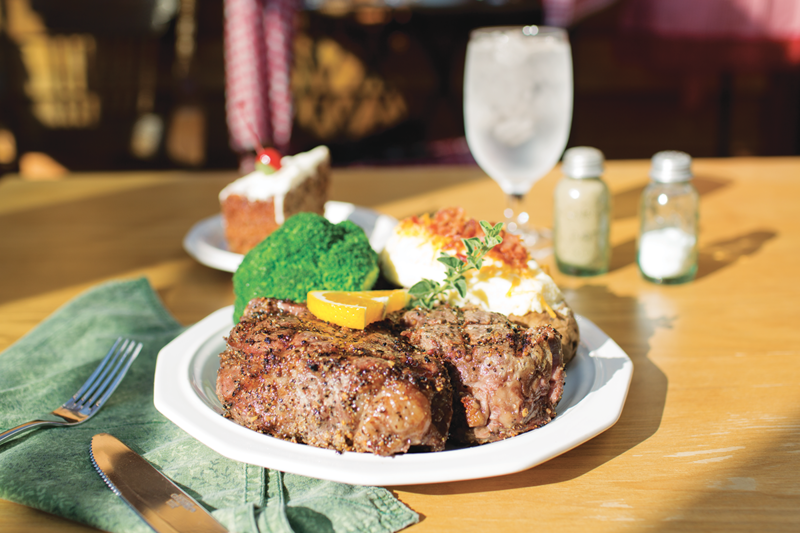 Nestled on 320 acres of sprawling farmland, the restaurant belongs to owners Kathy and Kent Abele, who have spent years raising beef. When the couple couldn’t find a great steak anywhere close by, they decided to grill their own, and just like that, Gobbler’s Roost became a hit. While the menu changes seasonally, the two steaks—the filet and the K.C. strip—are fixtures of the restaurant, and it’s easy to see why. And this is no typical portion of steak. They are carving up a huge cut of meat. It’s what Kathy used to serve the farm hands for lunch each day. On my visit the meal also came with salad, soup, a chilled round of cucumber filled with a creamy pineapple dip, a side of gnocchi, garden-fresh vegetables and dessert. It’s clear that no one leaves Gobbler’s Roost hungry. Five-course dinners are served Friday and Saturday from 5 to 10 p.m. by reservation only. Call 417-448-4853 to reserve a table, and come hungry! 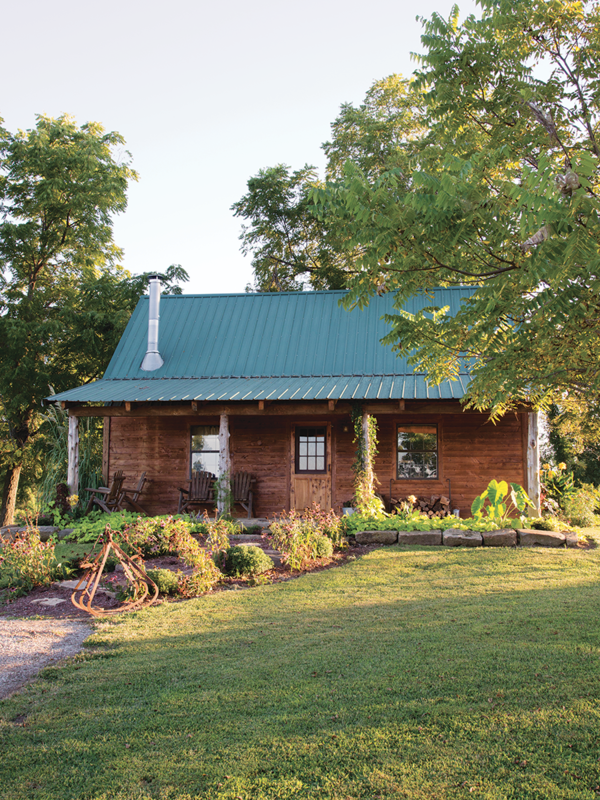 Photos by Chuck Travers (Left) Make a weekend of your journey, and stay in the cozy one-bedroom cabin on the property. 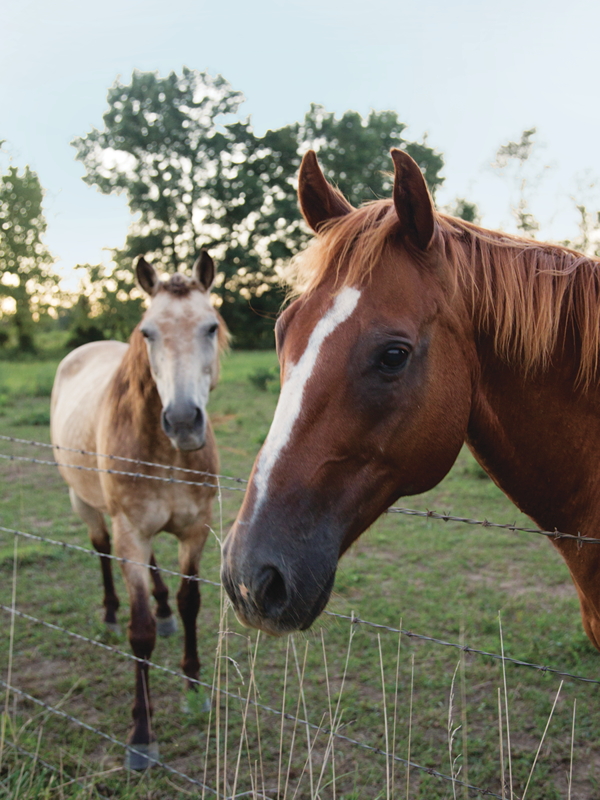 (Right) When you visit Gobbler’s Roost, you’ll likely see the horses who live on the charming property. With a vibrant art scene and lively night life, downtown West Plains is worth the drive, especially when you have time to eat at these three joints. This should likely be the first stop of your day. Order a tall cup of coffee and a homemade pastry, and plan out your afternoon over an apple turnover, blueberry cream tart or chocolate cupcake. The homemade pizzas here are too good to pass up, which helps explain why this downtown eatery fills up quickly during lunch when you can order pizza by the slice. Of course, there’s more than just fabulous pies. Try a calzone, a grilled chicken pita or the savory Cuban. Attached to the Historic West Plains Opera House, this fine dining restaurant offers the best of both worlds: great food and great live music. 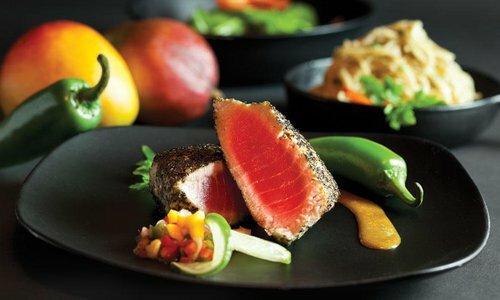 The menu changes seasonally, but look for the chili-glazed salmon, the restaurant’s specialty. Photo by Kevin O'RileyBe sure to try one of Public House Brewing Company’s beers. Some of our favorites are the Rod’s Cream Ale, Revelation Stout, Hide & Seek Hefeweizen and Elusive IPA. 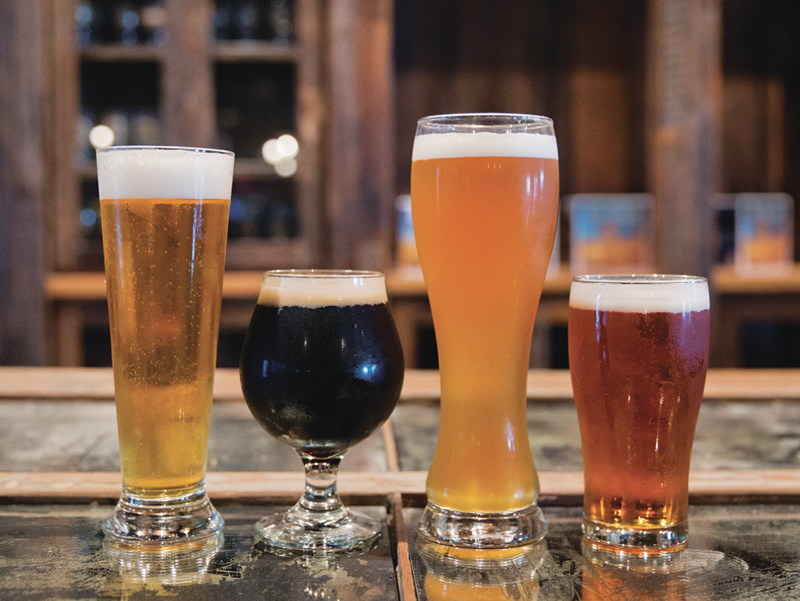 Just less than two hours east of Springfield, St. James is home to Public House Brewing Company, located off the I-44 for easy access to craft beer and upscale pub food. Owner Josh Stacy opened the first Public House Brewing Company (551 State Route B, St. James, 573-261-3333) in downtown Rolla, focusing on operating as a brewery and small pub selling everything they made in house right at the bar. When they outgrew the space, Stacy found a second location in St. James, right next door to St. James Winery. The full-production brewery and tasting room opened in November 2014, with a full kitchen and room to seat 250 people. The menu showcases what chef Alex Giger can do with locally sourced meat and produce. Customer favorites include the reuben, made with local beef cured in-house, and seasonal salads that change every month to ensure the freshest ingredients. 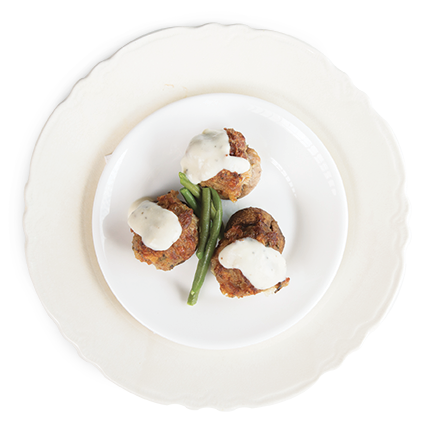 Try the delicious smoked trout fritters that are crunchy on the outside and soft on the inside, filled with smoky trout. 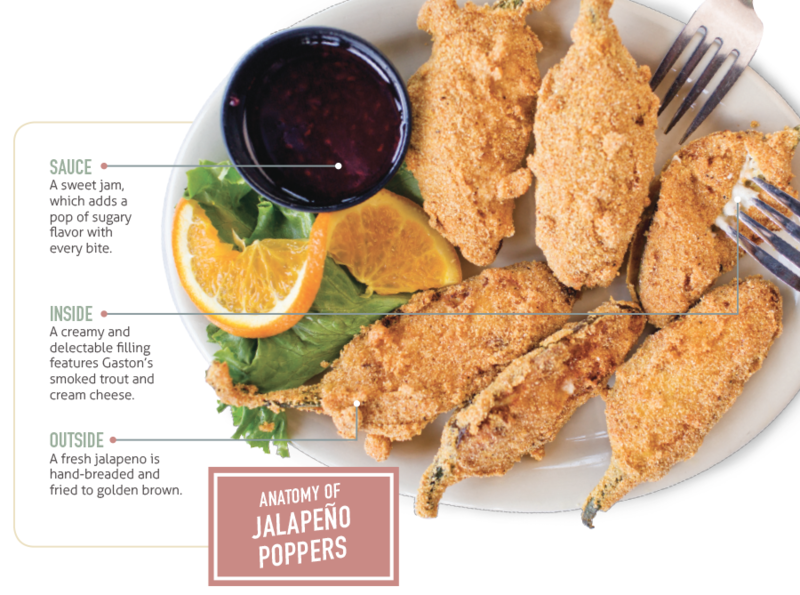 The real treat is in the garnishes: red onion slices and chunks of crispy, salty bacon top dollops of tangy remoulade sauce. When you’re in the mood for something briny, try the pickle plate. 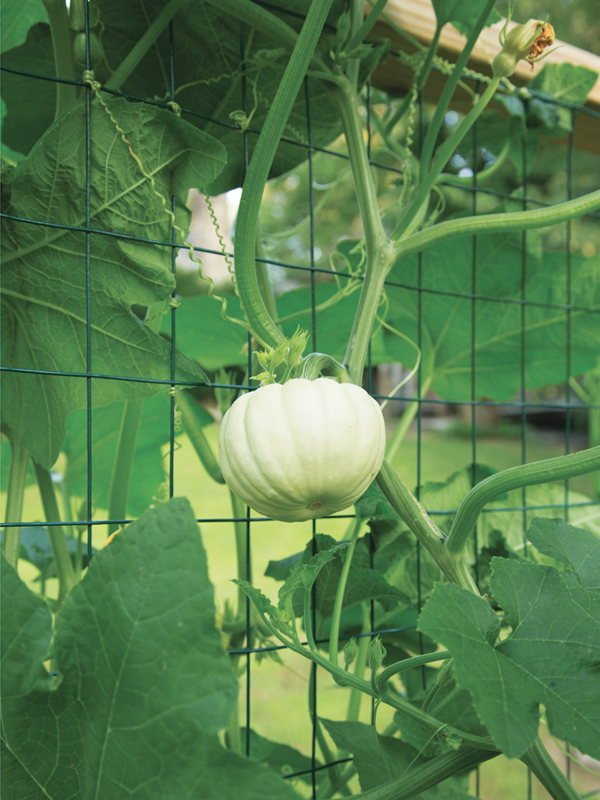 A mix of vegetables like cucumbers, okra and watermelon rinds take on a whole new sour flavor. Cap your meal off by ordering a fresh dessert, like the salty-and-sweet cinnamon-sugar sweet pretzel bites or a parfait blending seasonal fruits with creamy yogurt and crunchy granola. Don’t forget to pair your eats with some brews made by the experts in the back of the house. 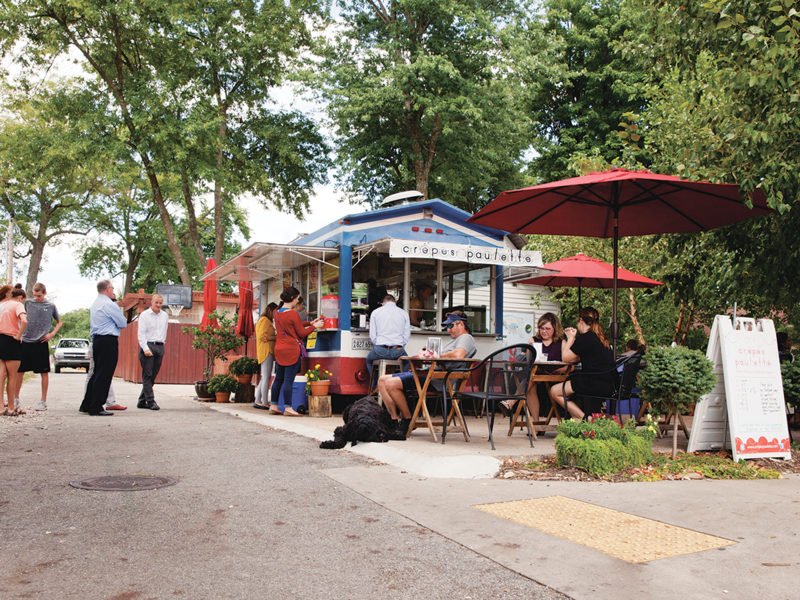 Photo by Brandon AlmsCrepes Paulette food truck offers up both sweet and savory hand-held crepes, and space to eat them out in the fresh air. 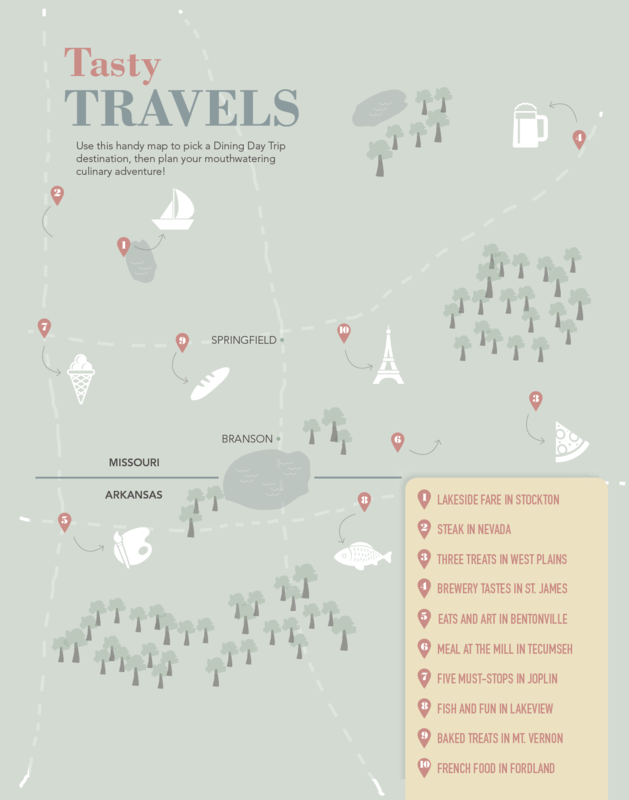 Bentonville, Arkansas, is just two hours south of Springfield and offers up tasty dining and artsy outings for everybody in the family. We put together one perfect day in Bentonville, so all you have to do is pack your bags and go. Photos by Brandon Alms (Left) You can't visit Bentonville without a stop at Kennedy Coffee. We recommend the sweet treats, many of which are gluten-free. 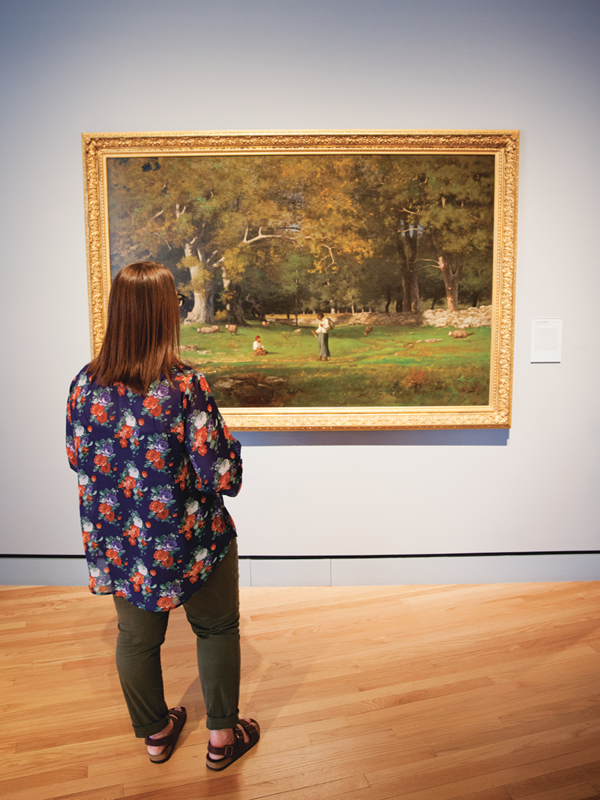 (Right) Bentonville's Crystal Bridges Museum of American Art is a great place to enjoy between several tasty spots. It features works from the 1700s all the way up to present day. 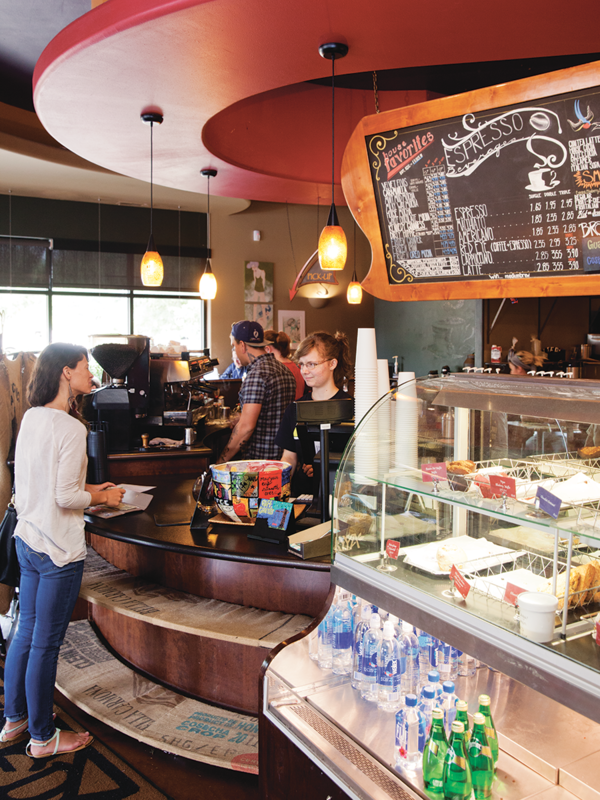 If you leave 417-land in the morning, you’ll arrive in Bentonville just in time to grab a tasty cup of joe and a sweet mid-morning treat at Kennedy Coffee. Open for 12 years, the classic coffee shop roasts its own beans. But not just for Arkansans: It also sells these beans to wholesale buyers across the globe who got a taste while visiting for Walmart business and just couldn’t get enough. While you’re there, pair a creamy latte with a gluten-free blueberry scone. Delish. After your morning pick-me-up, head to the 21C Museum Hotel. It’s where you’ll rest your head at the end of the day. But for now, just drop off your bags and explore. Its beautiful modern design is accented everywhere with one-of-a-kind art that graces the lobby walls and fills gallery spaces. Exhibitions change every six months, so each visit could mean new art to explore. Be sure to check out the “Fat Bat” sculpture (of an overweight Batman) that hovers over the hotel gym. Peek out the window to see a Tree of 40 Fruits in bloom, or find a fun resting place for one of the famed green penguins guests can move around the hotel. Across the street from the 21C Museum Hotel is a sweet little food truck that backs up to a cozy patio full of bistro tables. It’s Crepes Paulette, and it’s hopping in the middle of the day. Brave the long line, though. The sweet and savory folded crepes are worth the wait. Find a breezy table, and indulge in a classic ham and cheese crepe before finishing your meal with one filled with sweet strawberries. Walking trails peppered with sculptures weave through the grounds at Crystal Bridges Museum of American Art, and the museum’s architecture alone is a sight to behold. But it’s the collection of American art housed inside this museum that is most impressive. From a portrait of George Washington from the 1780s to a towering pop art still life by Roy Lichtenstein from the 1970s, the collection hits all the high points from the past 200 years. There are also changing exhibits, educational programs for both kids and adults and delicious food at Eleven Restaurant. Just down the road from Crystal Bridges is the kid-centric Scott Family Amazeum, a perfect stop if you have little ones with you. Kids can explore science, technology and engineering in the 3M Tinkering Hub. They can do science experiments with candy in the Hershey’s Lab, paint the walls in the Art Studio, burn off some energy in the Canopy Climber, relax and daydream in the Cloud Theatre, explore the deep dark Cave and so much more. It’s a great place to tire them out! Photos by Brandon Alms (Left) Oven & Tap specializes in locally sourced ingredients and finishes most of its menu items in a 1,000-degree wood-fired brick oven. (Right) When you're back at the 21C Museum Hotel, head down to The Hive for an after-dinner cocktail, like this lovely Dusk Till Dawn drink with tequila and a strawberry shrub. Stop for supper at Oven & Tap, a modern-rustic restaurant with a wood-burning stove where co-owners Mollie Mullis and Luke Wetzel and their staff whip up incredible wood-fired creations using local ingredients. The menu changes regularly depending on what’s in-season and available. Even the homemade lasagna is finished in the oven, creating irresistible crispy edges. Our favorite taste: The creamy burrata served over tender shaved summer squash and topped with bright mint, toasty sunflower seeds and nutty pecorino cheese. After dinner, head back to the 21C Museum Hotel. At The Hive, you can grab an after-dinner cocktail and some snacks at the lovely bar. Indulge in the Dusk Till Dawn, featuring Casamigos Repasado tequila and a strawberry-chervil shrub, and try an order of the oh-so-sticky sweet and spicy fries topped with local honey and cayenne and marash pepper. Yum! Photo by Chuck TraversChef Ryan Van Winkle regularly plans special menus for guests of his restaurant, The Chef's Table. There he prepares food in front of guests, plates each course and serves them one-by-one. 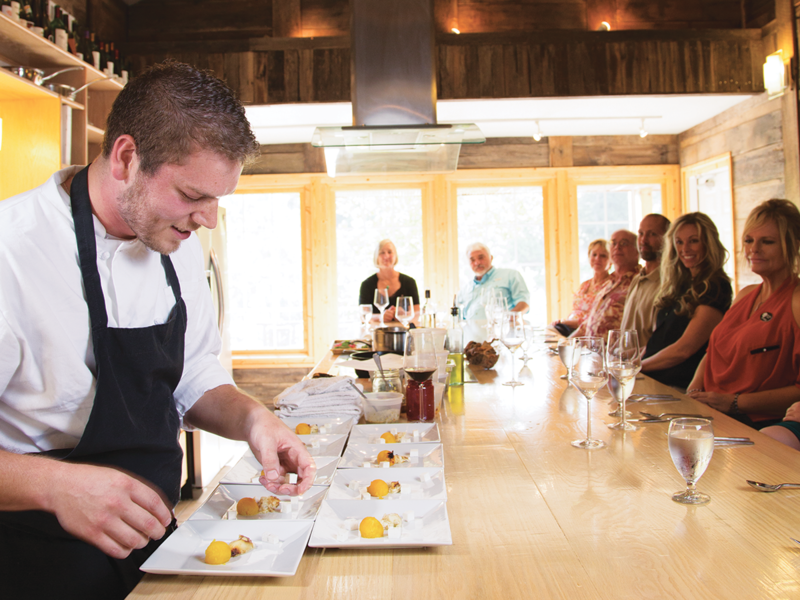 Make a trip to Dawt Mill Resort, and snag reservations at The Chef’s Table, which takes guests on a palate-pleasing culinary adventure unlike any other in 417-land. As we pulled our car into the driveway of Dawt Mill Resort, we listened to the gravel crunch under our tires and agreed it felt as if we were transported back in time. I was with my friend, Kaitlyn McConnell, and we were both happy to see the property after our two-hour drive. The spot is scenic, with the mill, established in 1897, still boasting an old-timey charm. We were there for dinner at The Chef’s Table, the fanciest restaurant on the property. A hand-hewn oak table built around a central kitchen takes center stage, and oversized windows and reclaimed wood preserved from other buildings on the property complete the intimate, rustic-modern atmosphere. 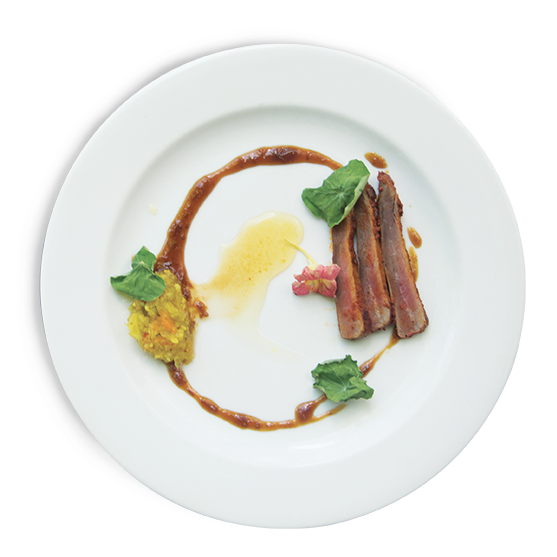 It’s home to Chef Ryan Van Winkle’s elaborate dinners, which can seat as many as 12 guests for 3 to 12 courses. When we entered the restaurant around 4:30 p.m. for our 5 p.m. reservation, Chef Ryan was behind the counter working on prepping our 12-course meal. He had been at it since early that morning. Along with his culinary arts training, a plethora of hands-on experience and a vast knowledge of all things food, Chef Ryan is tall and handsome with an adorable smile to match. We were more than happy to have him as our host. Our 12-course meal was broken into five flights, each with a wine pairing. With each course, Chef Ryan explained where the ingredients were from and how he paired and prepared them. Much of what we ate came from the gardens on the property, and the few proteins and cheeses that didn’t come from right outside the door were sourced locally as well. 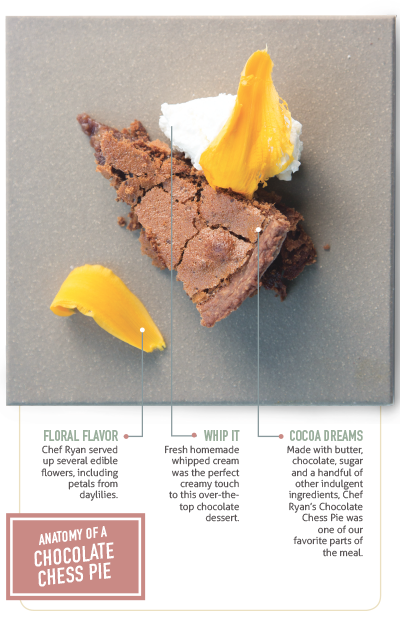 Chef Ryan plans his menus based on what’s available, so there was a freshness with every forkful. 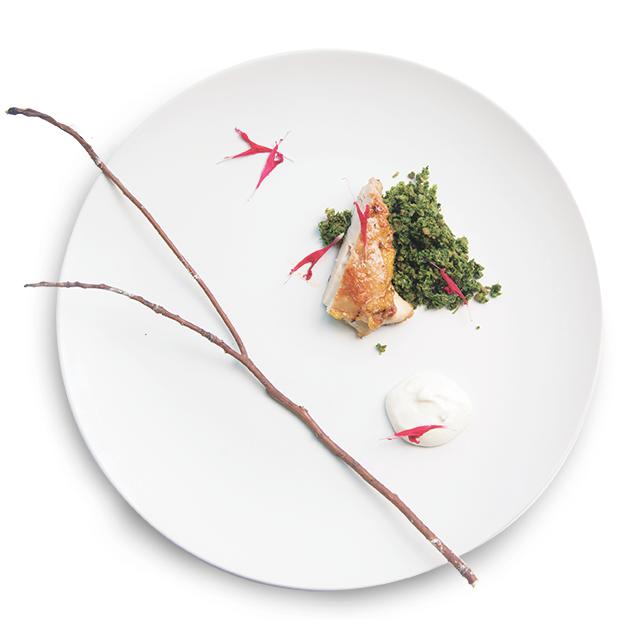 His culinary talents shined with every plate, as he paired simple items like local country ham, pork jowl and sausage with locally grown delicacies like squash blossoms and lichen. It was unexpected, and it was out of this world. Photos by Chuck Travers (left) Chef Ryan prepares all of his meals with locally sourced ingredients, many grown in gardens on the property. (right) Dawt Mill Resort is home to cabins, a house and an inn, all that offer plenty of lodging and make the perfect weekend getaway. I definitely plan to go back and visit Chef Ryan again, and next time I might just stay and have more than one meal. 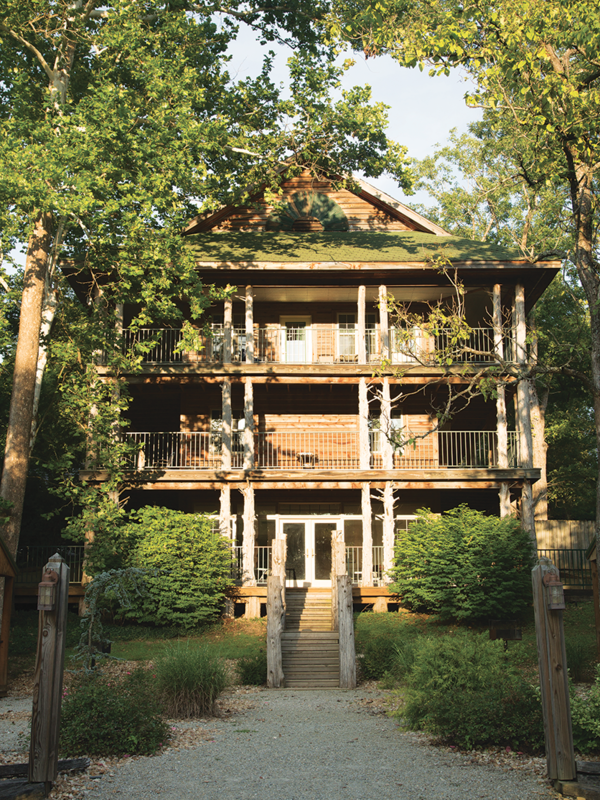 A handful of cabins, a house and an inn offer plenty of lodging and make Dawt Mill Resort a perfect weekend getaway year-round. Not much in this world sounds better than two consecutive days of Chef Ryan’s cooking. Who said dreams don’t come true? 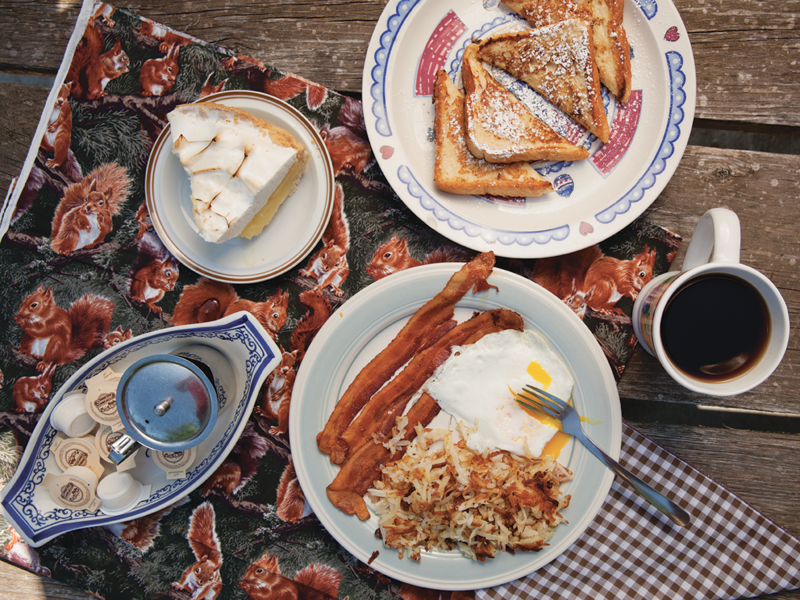 Photo by Brandon AlmsStart your day off right with stick-to-your-ribs bacon, eggs and hashbrowns or sweet French toast and pie at Mary Lee’s Cafe. 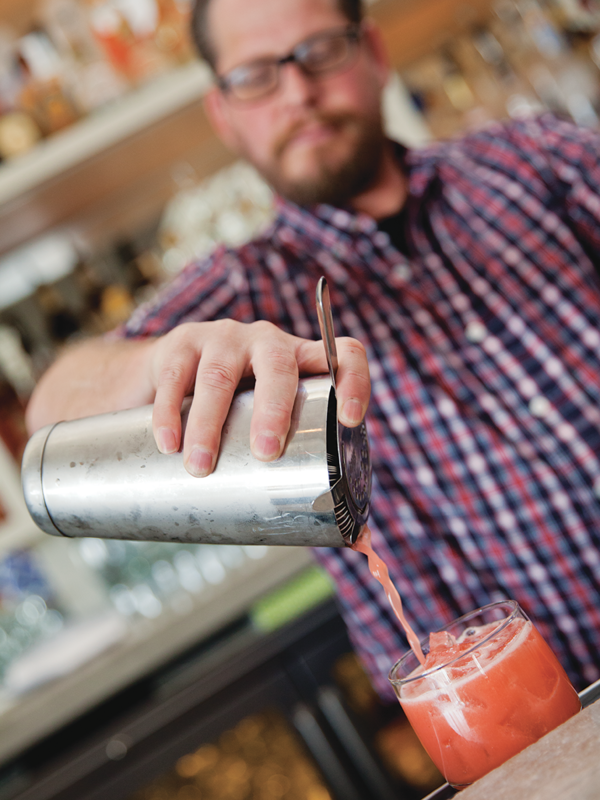 New restaurants, cafes and bars are opening left and right in Joplin, so Assistant Editor Ettie Berneking decided to load up the car with Art Director Heather Kane and photographer Brandon Alms to spend a day eating her way through five of the city’s eateries. This cozy house-turned-café was a suggestion from City Hall, and as soon as we walked into Mary Lee’s Café (712 W. 20th St., Joplin), I knew we had struck gold. Nine tables and 33 chairs are all that fit into the tiny, one-room café, and we were clearly the only out-of-towners around this morning. Everything here is homemade, including the assortment of pies: lemon meringue, chocolate, blueberry, cherry, apple and pumpkin in the fall. The biscuits and gravy are better than any I’ve ever had. Instead of cracking open individual biscuits, the kitchen here bakes one giant biscuit in a pie pan and cuts out enormous squares of warm, soft bread that are drowned in a delicious peppery white gravy. After finishing off my slice of lemon meringue pie, a forkful of hashbrowns and a slice of crisp bacon, I ordered a third cup of coffee and settled in for some quality people watching. Photos by Brandon Alms (left) If you're visiting Joplin, a stop by Grand Falls waterfall is a must. 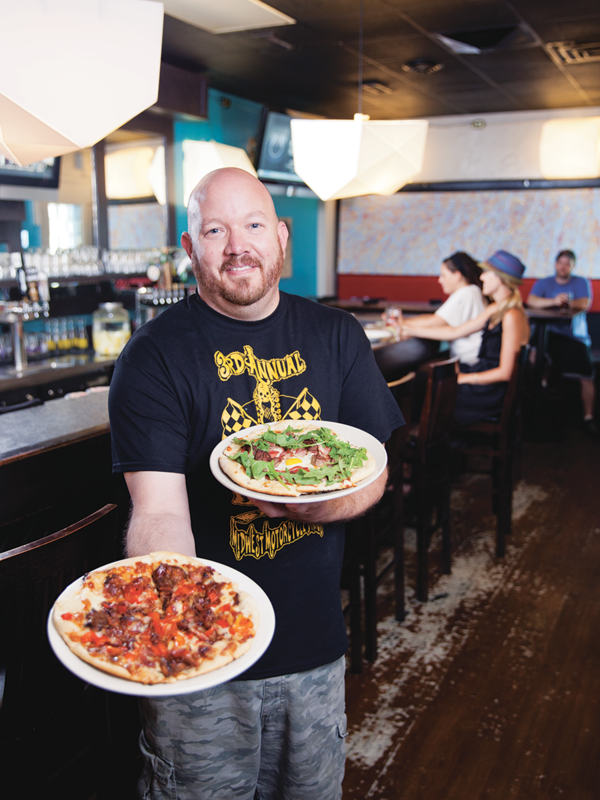 (right) Duke Walter serves up pizzas at Midtown Pizza Kitchen, a restaurant that is quickly becoming a town favorite. With a picnic basket loaded down with water, snacks and some light reading material, we ventured down the road to the Grand Falls waterfall. We weren’t the only ones at the falls. Several other groups of people had moseyed over for a quick dip in the cool water or to enjoy the view. Already devout fans of Jason Miller’s creative eateries, Instant Karma and Eagle Drive-In, we knew we had to stop at his latest venture, Midtown Pizza Kitchen (1212 S. Main St., Joplin). Several of the pizzas are named after other Joplin restaurants, including the Bruncheonette, which we ordered. The pie features crispy-yet-chewy New York–style crust topped with a garlic cream sauce, coffee-rubbed slices of tenderloin, prosciutto, creamy mozzarella, provolone, fresh arugula and a fried egg. Oh, we also had the Burrata Cheese Fried, a mozzarella stick on steroids. 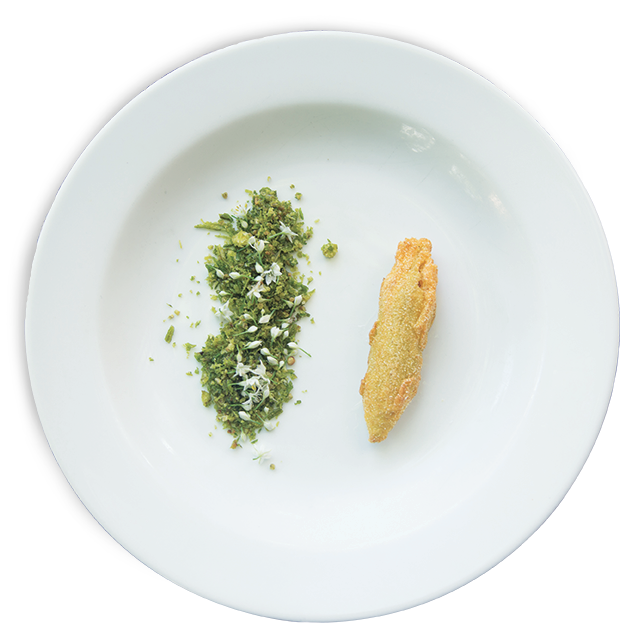 To make this dreamy creation, an entire mozzarella ball is breaded and deep fried. Next it is artfully dropped in a pool of fresh tomatoes and beautifully drizzled with pesto aioli. There are no words to describe how incredibly delicious this thing tasted. Pizza and ice cream? If there is a better combo out there, I don’t know of it. And lucky for us, Sweet Caroline’s Creamery (1027 S. Main St., Joplin) is located practically across the street from Midtown Pizza Kitchen. This vintage creamery has plenty of bright blue charm, and I ordered a double scoop of ice cream indulgence: pistachio and some sort of butterscotch, brownie and caramel swirl. Photos by Brandon Alms (left) While it's a great town for eating, Joplin is also a great spot for shopping. 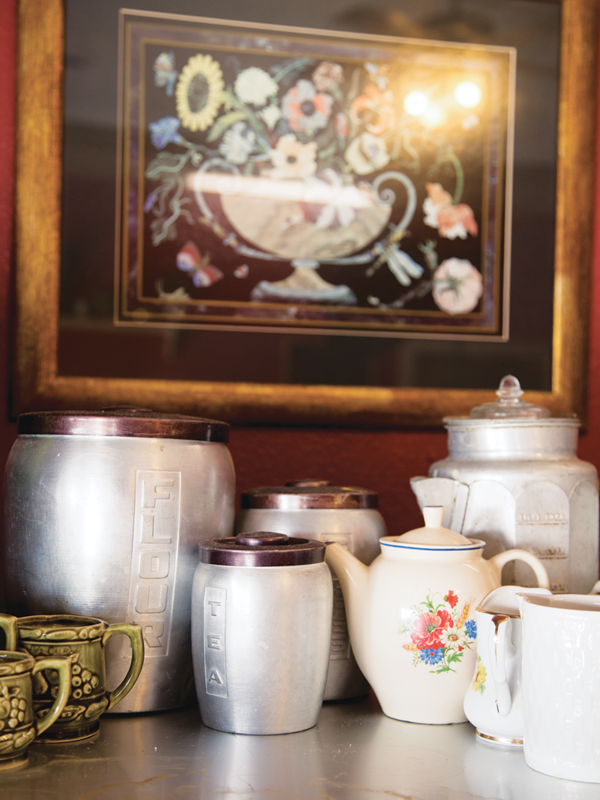 We love the range of local boutiques and antique stores, including Simply Vintage. (right) The Dining Car serves up a variety of first-class fare, including shrimp cocktail, The Canyon Creek Pass chicken and shrimp tacos. For our last meal of the day, we popped into The Dining Car (1027 S. Main St., Joplin), a farm-to-table restaurant located inside the beautifully restored Gryphon building. You really can’t go wrong here. 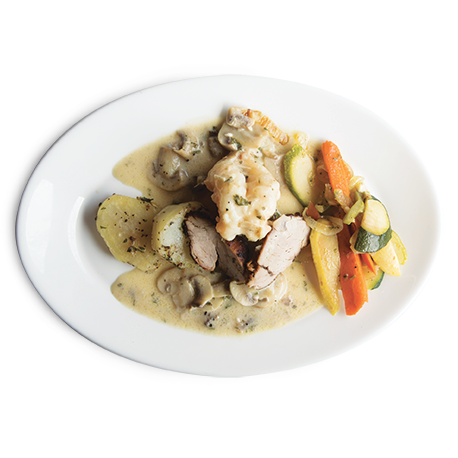 The Canyon Creek Pass Chicken is a crowd favorite, and after just a few bites, it became one of our favorites as well. This stack of deliciousness starts with a bed of peppery mashed potatoes and is followed by a juicy fried portobello mushroom, a pan-roasted chicken breast, sliced avocado, feta cheese and the house-made Gryphon sauce. With pinkies raised and our belts loosened, we ordered a shrimp cocktail with lemons and the Caesar salad with grilled chicken (which we thought would be a smaller size, but turned out to be enough to feed all three of us). By the end of our meal, we needed a forklift to haul us to the car. Half the fun of wandering through Joplin is talking with store and restaurant owners to learn which joints they would recommend, and the guys at Midtown Pizza Kitchen recommended we end our day at Infuxn Boaka Bar (530 S. Main St., Joplin). This vodka bar is unlike anything else you’ll find in Joplin, in part because it’s Joplin’s only ice bar. But it also has stunning décor, bright lights, deep blue leather booths and an inventive cocktail menu that all make it stand out from Joplin’s crowd of dive bars. To really finish our day out with a bang, we ordered a round of Moscow mules and watched the sun set over Main Street. Hungry for more? These five Joplin eateries have won over our hearts and our taste buds several times. If you can’t squeeze them into this visit, then make them your reason to come back again. Gourmet burgers mix with some not-so-ordinary diner eats like bone marrow, prime rib and a daily special board you’re be drooling over. Who says grilled cheese and hot dogs are only good when you’re a kid? These wacky and often wild versions are nothing but delicious. Good Italian food with a dark, romantic atmosphere. Does it get any better? Fine dining with a wide selection of seafood has made this restaurant a Joplin favorite. 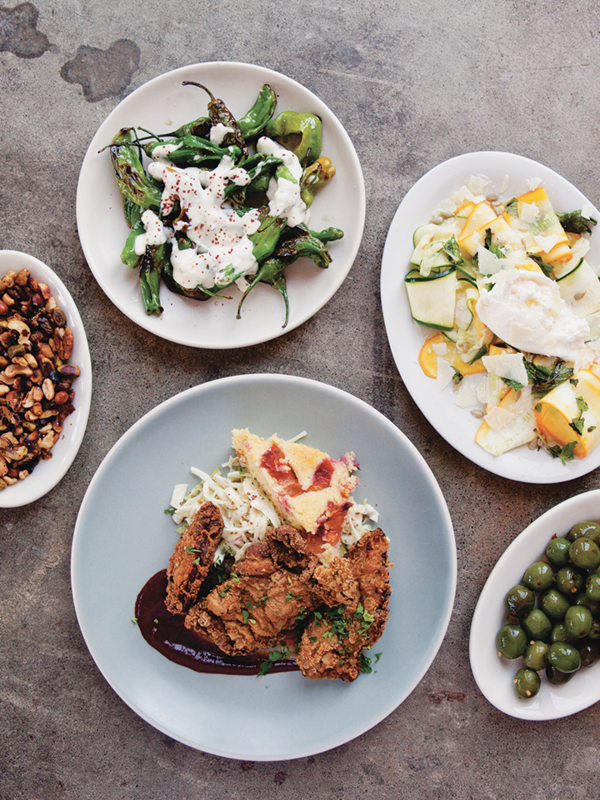 Run by a sweet couple who really know their way around the kitchen, this neighborhood soul food joint is whipping up some seriously delicious fried chicken. Photo by Chuck TraversLocated on the White River, the views at Gaston’s are as pleasing as the food. Countless delectable entrees and a breathtaking river view greet guests at the restaurant at Gaston’s White River Resort. Once you step into the restaurant at Gaston’s White River Resort, you’ll notice rows of boat motors lining the ceiling. A few turns later, you’ll see dozens of vintage bicycles hanging over your head, and you’ll be greeted with an expansive dining room lined in windows that boast a fabulous view of the White River. The one-of-a-kind décor and breathtaking scenery make the location half of the fun. The other half, of course, is the food. Gaston’s menu is large and features a range of fish entrees along with some traditional American dishes. 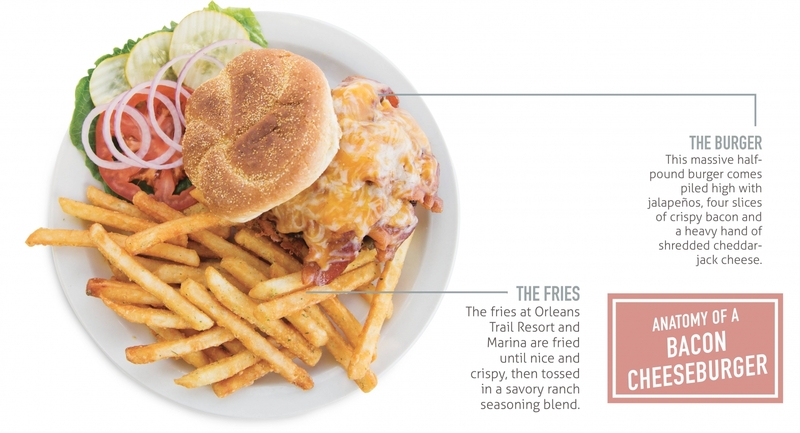 Those in the mood for the ordinary can choose from an array of loaded burgers, sandwiches and salads, and hungrier guests have plenty of options with the Ozarks hickory smoked ribs, chicken fried steak, filet and ribeye. There’s even a handful of pasta options for those who crave Italian fare. 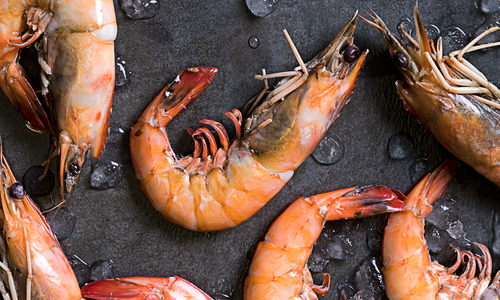 If you only have one chance to eat here, though, we recommend you try the fish. The pan-seared rainbow trout with the house-made creamy supreme sauce is among the restaurant’s many favorites, or you can opt for fried trout, fried catfish, cod or salmon. And if you’re an eat-what-you-catch kind of person, you can do that, too: The restaurant will broil, pan-sear or fry your catch! No matter what you order, make sure to also make a trip to the Salad Boat, Gaston’s fully loaded salad bar overflowing with an abundance of fresh veggies, fruits, salads, cheeses and meats, all housed in an old wooden boat. 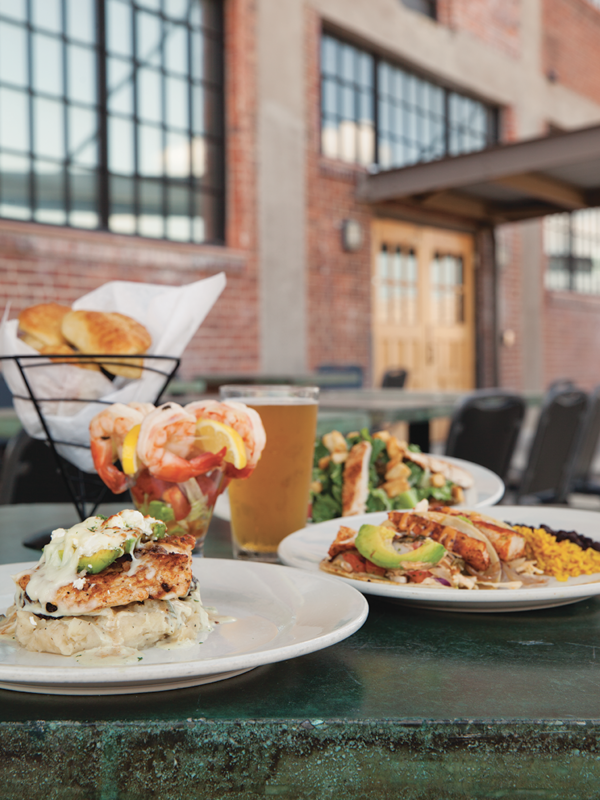 Feasting on great food while taking in a fabulous view of the river? Yes, please. Photo by Chuck TraversLocated just south of the town square, That Crazy Redhead’s Bakery & Cafe in Mount Vernon is a great spot to grab lunch or a sweet treat. Travel 40 minutes west of Springfield to Mount Vernon and stop at That Crazy Redhead’s Bakery & Café (218 S. Hickory St., Mount Vernon, 417-316-9068). This corner café offers some delicious eats. 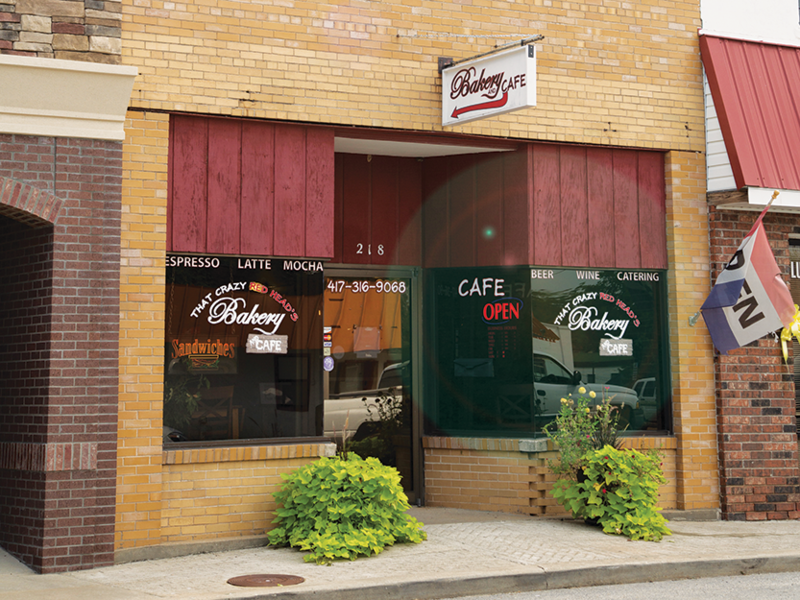 Owners Ted and Heather Scharbach opened as a bakery and expanded to include a full day’s menu. These five dishes are must-tries for sure. 1. 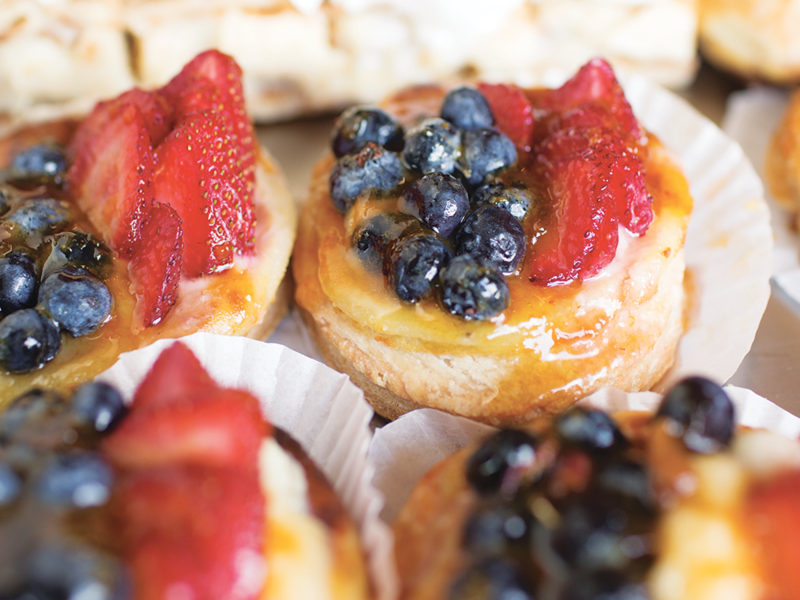 Start your day with a star-shaped Danish filled with cream cheese and seasonal fruit. The breads, sweets and other treats are all baked fresh daily here! 2. If you’re popping in for lunch, keep an eye out for the specials. 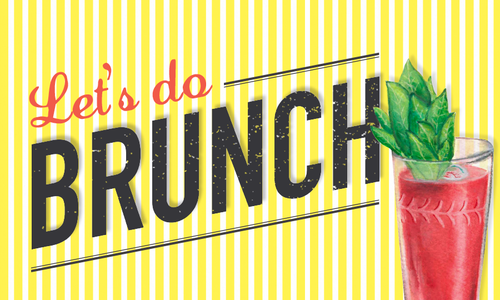 We suggest you try the buffalo chicken salad sliders with mango pineapple salsa and tortilla chips on the side. 3. When your stomach growls for a heaping lunch, grab the beef and blue wrap made with angus steak, gorgonzola cheese, lettuce, onion and tomato on an herb tortilla. It satisfies without overfilling you with carbs. 4. On a cool day, warm up with a bowl of homemade soup. 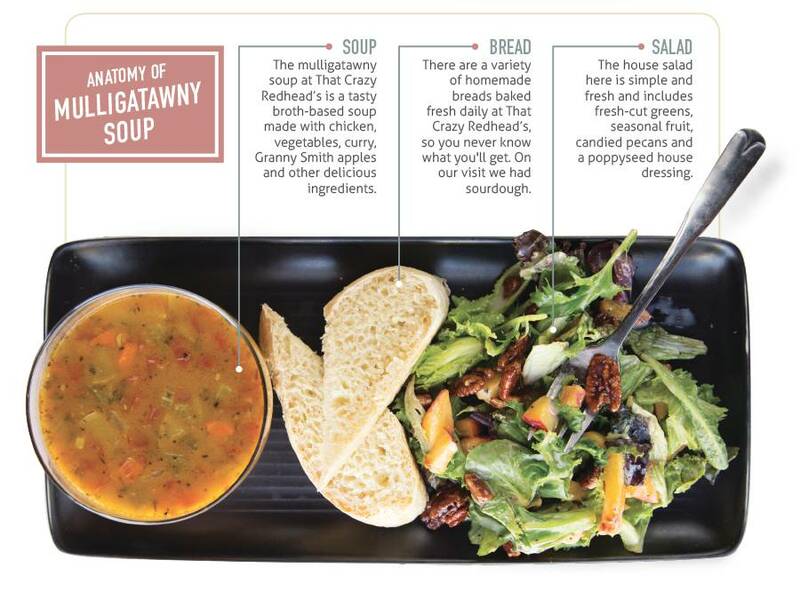 One of Heather’s specialties is the mulligatawny soup. 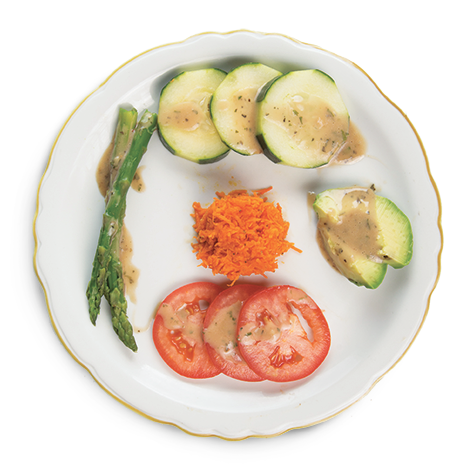 For an extra treat, pair it with a seasonal salad and homemade bread for dipping. 5. Finish the whole thing off by giving in to your sweet tooth craving. All of the desserts are rich and to-die-for. The bakery case always houses something new, but keep an eye out for rum pecan pie chocolate cupcakes. While you’re there: After getting your fill at That Crazy Redhead’s Bakery & Cafe, walk right down the street to Williams Creek Winery (310 S. Hickory St., Mount Vernon, 417-466-4076). Enjoy samples of wines made with Missouri-grown grapes, and take home a bottle or two for your next dinner party. Try the spiced apple wine; it’s perfect for the holidays. And order the: Catfish of course! Photo by Chuck TraversWhile all the food at La Gallette Berrichonne is delicious, the desserts alone are worth the trip. Located only 30 minutes east of Springfield, Fordland’s La Gallette Berrichonne French Bakery and Café is a one-of-a-kind restaurant that’s well worth the drive. Plopped right on the main drag in the small town of Fordland, La Gallette Berrichonne (143 E. Main St., Fordland; 417-738-2112) is a French bakery and café that has a definite leg up on other restaurants of its kind. While it’s located in a little 417-land town with a population of just around 800, people from all over the state travel here to enjoy the one thing that matters most when it’s time for a meal: the food. Open regularly for breakfast and lunch and offering special seven-course dinners on Friday nights, this gem is well known for its delectable French entrees and pastries made by the one-and-only French Chef Roland Parny. The restaurant itself is modest, with a metal building exterior and a handful of cozy tables and booths dotted throughout a main dining area. Photos by Chuck Travers (left) Chef Roland Parny loves cooking up a variety of French food and desserts at his Fordland restaurant. 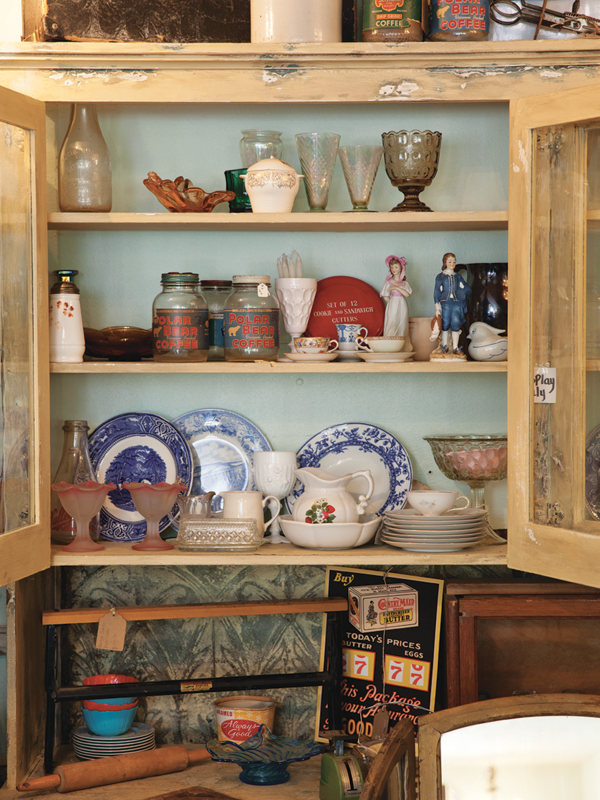 (right) Located in Fordland, the small restaurant features many cutesy finds and accessories. 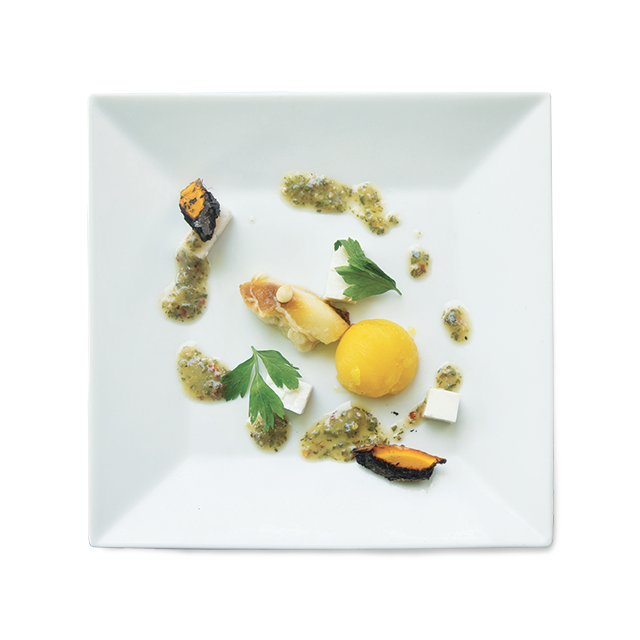 Chef Roland Parny attended Saint Amand-Montrond Cher culinary school in Central France at age 17. Next he attained 55 years of cooking experience in kitchens all around the world, and he was even instrumental in the inception and start-up of national bakery-café chain La Madeleine. 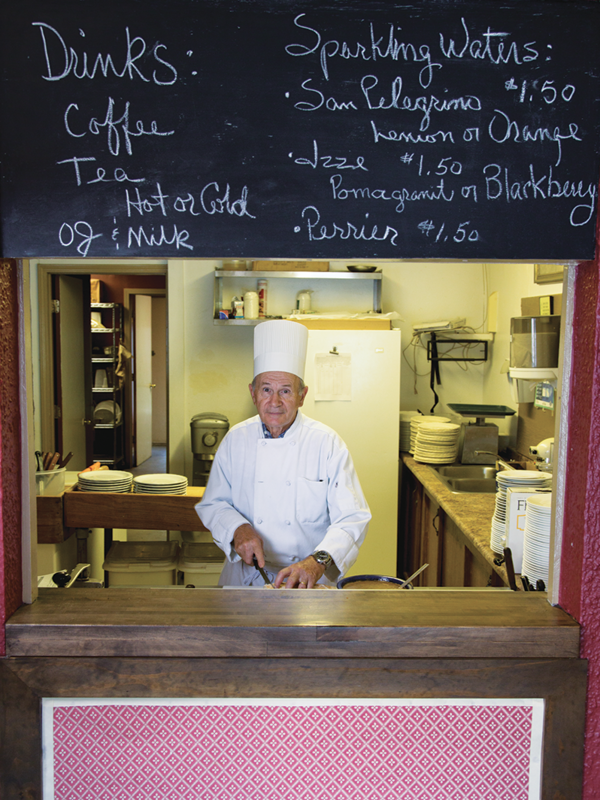 Now he’s the star of the show at Fordland’s La Galette Berrichonne, where he works closely with his small staff that includes his sweet and charming wife, Elaine. An early morning breakfast here is sure to provide delightful conversations with the wait staff, and if you stop in for lunch, you’ll get a meal for a steal with dishes like beef burgundy, Chicken DuBois, seared salmon and more, all for around $10. But if you really want to treat yourself, we recommend calling and snagging a spot at one of Chef Roland’s seven-course French dinners on a Friday night. The menu at La Galette Berrichonne changes each week. Here's what we had on our visit. Photos by Chuck TraversCrudite Plate: The meal started off light and fresh with an arrangement of seasonal vegetables drizzled with Chef Parny's homemade walnut oil vinaigrette. Photos by Chuck TraversStuffed Mushrooms: Course No. 2 was small but mighty and included mushrooms stuffed with a savory pork mixture and topped with Mornay sauce. Photos by Chuck TraversSalmon Salad: Plenty of light, flaky salmon was mixed with potatoes, garlic, a selection of herbs and a homemade oil-based dressing for course No. 3. Photos by Chuck TraversPork Tenderloin and Lobster: Featuring pork tenderloin and lobster drizzled with a cream sauce, course No. 4 was the heaviest course of the meal. 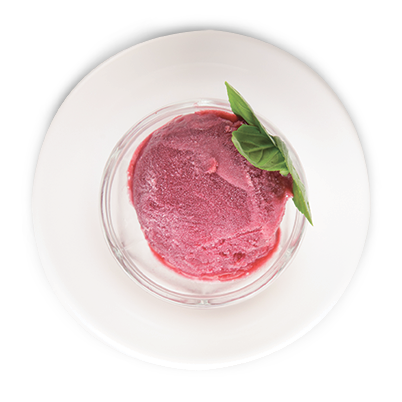 Photos by Chuck TraversRaspberry Sorbet: Known for its palate-cleansing abilities, a homemade raspberry sorbet provided a cool break during course No. 5. Photos by Chuck TraversCheese Plate: The cheese plate served as course No. 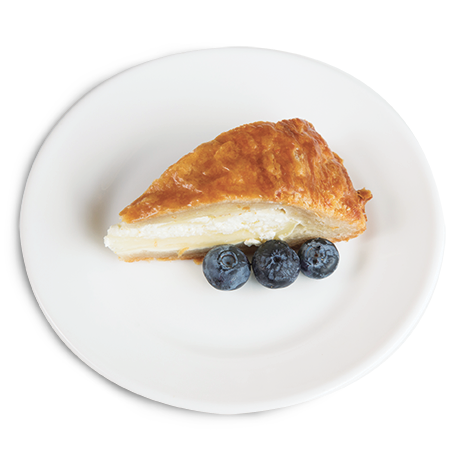 6 included flaky pastry around a creamy combination of goat cheese, Swiss cheese and brie. Photos by Chuck TraversDesserts on Display: The mini desserts served for course No. 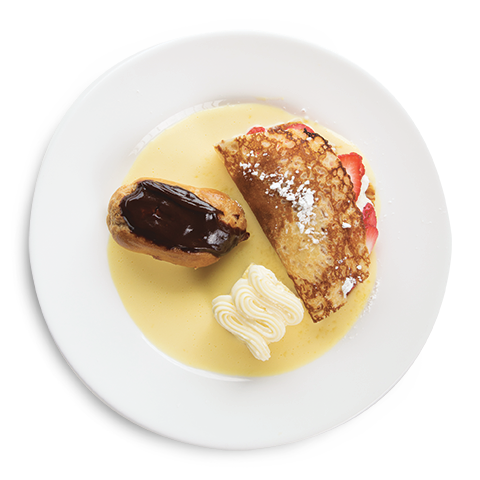 7 included a miniature eclair, a rum cake with crème anglaise and a miniature crepe with fresh strawberries and mousse. For these special events, the lights are dimmed, tables are dressed with linens and Chef Parny pulls out all the stops to create a memorable French meal. 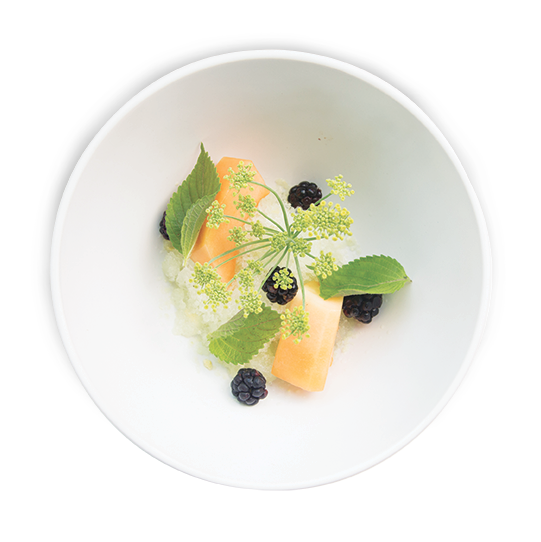 While the food differs each week depending on what Chef Parny finds on his shopping trips, you’ll often enjoy a crudité plate or a soup, a delectable protein, a sorbet palate changer, a cheese presentation and a mouthwatering French dessert. Speaking from experience, it’s all absolutely rich, indulgent and delicious, and it’s a steal at only $45 per person. A highlight of the event happens mid-meal, when Chef Parny comes out from the kitchen and chats with each table of guests. 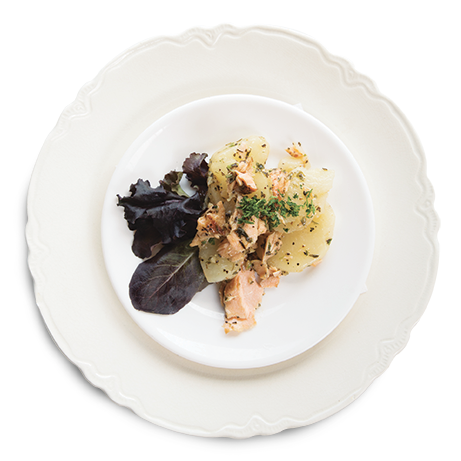 Oh, and if you’re new to French cooking, have no fear: Chef Parny is from the rural area of La Berry, France, and he describes his cooking as mom’s home cooking with a little flair. Photo by Vivian WheelerSchofield + Gray is an outdoor market that’s hosted in Fordland once per month. Check out its Facebook page to see dates, then head over and look for a treasure. If you head over for a meal off the regular menu on a Saturday, plan to go on a weekend when the Schofield + Gray outdoor market is in session. 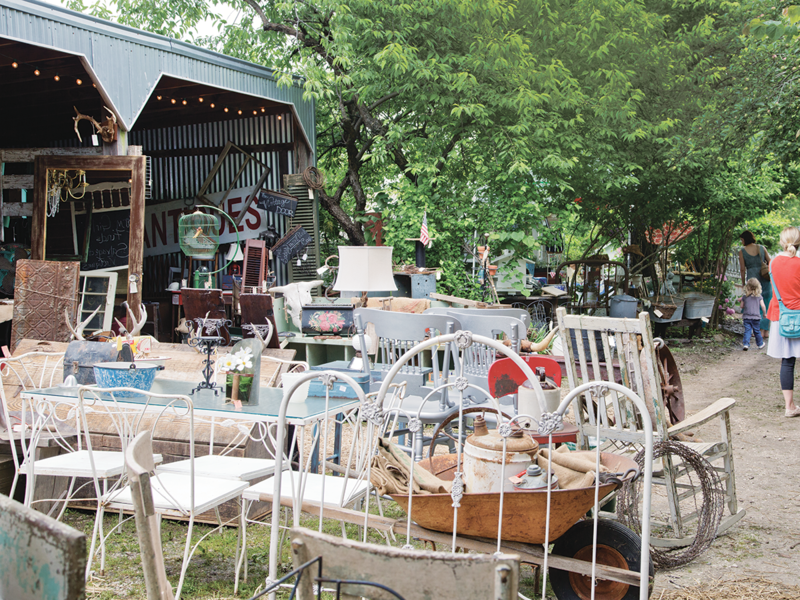 Once per month, the guys from Springfield’s Grayson Home transform an old Fordland homestead into an outdoor wonderworld with live music, grilled hot dogs and several visiting vendors who sell new home décor items and a huge collection of refinished furniture, antiques and collectables. Find dates on Schofield + Gray’s Facebook page.